Three years ago, unicorn powder spread all over the internet, trend crossing will ol’ good nyan cat, letting rays of multicolored stripes and dots on our clothes outside of the screen. The first designer to have sniffed some (unicorn powder) was of course Alessandro Michele at Gucci, ringing the end of the Celine “minimalism only” era, following tons of internet kids. Himself followed by a bunch of other designers, influencers and fashionistas. Now the trend has gone massive: it is everywhere on high street fashion. Yet, as it is a tricky one, you do not see it that much on the streets. At least in careful Paris. Here are my tips to do rainbow without looking like you escaped the circus (hint: start by not copycatting Gucci’s look straight from the catwalk). 1/ What colors to match the rainbow? Easy one: as your rainbow piece contains many colors, you just have to pick one of them and make it the color of your plain matching second piece. My advice if you want to look mildly eccentric (as opposed to plain eccentric), would be to choose an understated or neutral color in the mix, rather than it strongest color. At least for the main match. For accessories you can easily be more daring. For instance, underneath I picked the white stripe as the color for the main match and kaki (kind of matching the green) for the matching color of accessories. Imagine if I had chosen green as the color for the bottom, the result would have been kind of overwelming wouldn’t it? Always a safe choice is blue denim from light to dark. It brings a nice balance to the busy colors. And this even if your multicolored print has no blue as I consider denim being a quasi neutral color. I generally recommend neutral colors to balance your multicolorored print but the choice of those neutrals depends of the tones of the multiples colors in your print. Are those bright, pastels, fainted or dark? So many options. With pastel I like crisp white. Picture a chanellesque jacket in pastel tweed with a loose white Tee and natural medium blue jeans. Light greys and beige also are excellent compagnons. With a warm multicolored mix featuring shades such as rust, olive or prune, I like pairings with black or dark blues. Camel and beige as layers also are nice matches. And crisp or off-whites for daytime. With brightly colored multicolored items, I like mixes with crisp white, greys, beiges, navy blue or black. Do you see the dark pleast of this skirt? Perfect to match it with an all black combo (I could also have chosen some colored accessories like a red belt instead for instance, but not a red top). 2/ What rainbow item choose? 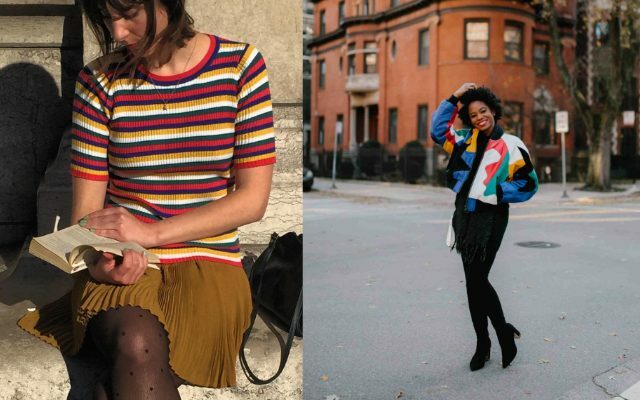 Whether horizontal or vertical, with thin or large stripes, sophisticated or casual the rainbow top has so many options, is flattering and can be mix with plenty of plain bottoms. Quite trickier, the easiest pick being the vertically striped skirt. Horizontal options often being poorly flattering. When it comes to pants, vertical stripes are not easy to pull off and horizontal even more difficult. For all of those, I advice matching with a plain top. 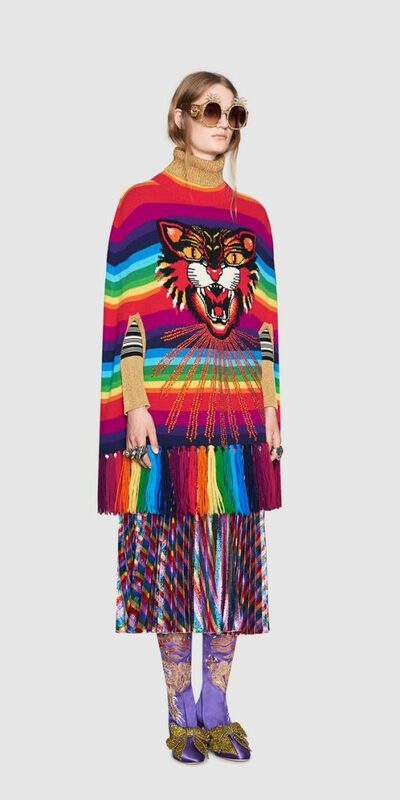 As strange as it may sound, the rainbow dress is easier to wear as the bottom as it doesn’t set the focus on only one part of the body but on the whole. Just match it with colored accessories and voilà! Singular because one is way sufficient. As usual, accessories are the easy way into a trend. Crazy spice girls like shoes or thousand colors scarves, the choice is yours. To wear with a rather neutral outfit. Or with neutral prints like black and whites. For instance a breton top with multicolored shoes. Hope you enjoyed this little trip in candy cane fashionland. And you? Do you like this trend? How do you wear it? Ce qui d’ailleurs me rappelle un commentaire que j’avais fait à propos du “non-rappel des couleurs” disant que quand on porte des pièces multicolores, il fallait quand même mieux choisir des teintes coordonnées avec à celles du patchwork pour le reste de la tenue, sinon, ça fait mal aux yeux !